What Do Members of Congress Tweet About? As it turns out, it’s not always about hitting a deer with your car. Here is a guest post from political scientist Heather Evans. Many members of Congress are on Twitter, and we can track, via a site like Tweet Congress, how often these members tweet and how many people follow them. But what we still do not know is how members of Congress use Twitter. A recent study on the use of Twitter reports that most of what people do on Twitter is “pointless babble.” Do members of Congress also use tweet endlessly about what they had for lunch? What do they tweet about? I led a group of researchers from Sam Houston State University that set out to figure out what members of the House and their competitors were tweeting about in the last two months of the 2012 election. In total, 67,119 tweets were coded for 1,119 individuals. 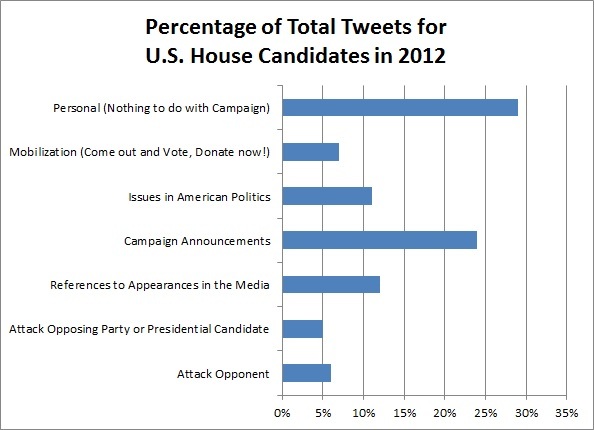 On average, candidates for the U.S. House tweeted 88 times over the last two months of their campaign, and most of what they were tweeting about was in reference to their campaign. Only 29% of the tweets were “personal” (or “pointless babble”). The rest of their time was spent tweeting about their campaign, trying to mobilize their supporters, attacking their opponents, attacking the opposing party or presidential candidate, linking up stories about them in the news media, and discussing important issues in American politics. On average, candidates also communicated directly with their followers 13 times. The results also show that no two candidates tweet alike. There were partisan, gender, and race specific differences. Republicans were more likely to attack the Democratic Party and President Obama, but otherwise used Twitter at comparable rates and styles to their Democratic rivals. Third party candidates, however, used Twitter extensively if they had an account (most did not). One candidate (Steve Carlson, a Tea Party candidate from Minnesota’s 4th district) tweeted over 1,100 times during the last two months and tweeted about President Obama 282 times. Women candidates were more active Twitter users (having more followers and tweeting more often). Women were significantly more likely to attack their opponents and use mobilization, campaign, and issue-based tweets. While incumbents had more followers, challengers spent significantly more time tweeting about their campaign. Challengers were more likely to tweet attacks, talk about their campaign stops, link up media reports, and interact with other Twitter users. Competitiveness also mattered. While those in competitive races tweeted at about the same rates as those in safe districts, they tweeted differently. Those in competitive races were significantly more likely to use attack tweets than those in safe races. They were also more likely to try to mobilize their followers. Those in safe districts, on the other hand, were more likely to attack the opposing party and presidential candidate. For more information on the coding method or questions about the availability of data, please contact me. How Do You Know If Someone is Gay? 10 Responses to What Do Members of Congress Tweet About? Is there any correlation between “personal”/”pointless blather” tweets and electoral success? Losers tweet significantly more often, including more pointless babble. Hmmm. But I suppose that could be because challengers tweet more and challegers are less likely to win. Good point! Winners were also significantly less likely to use attack tweets. Interesting post. Curious, is there any difference between members of the House and Senate? True – that might explain it. It may also be that they attacked more because they were playing offense (trying to keep their seats). On your second question – other research has shown that in competitive races, there is significantly more campaign information presented to constituents (both positive and negative). For some research on this, check out Goldstein and Freedman (2002). Did you distinguish between accounts used by candidates themselves, as opposed to a staff member? No. That actually is pretty hard to do. I’d be willing to bet that most of the third party candidates are tweeting themselves. Most incumbents have enough money that they could hire staff to tweet for them, but it is impossible to figure out who is tweeting based on the tweets alone. To do that, we would have to contact each person running and ask them who is tweeting. It’s a great question, but one that we were unable to code for.